March 8 was International Women’s Day, a celebration of women’s achievements and progress. It’s a day for all us to celebrate the things we and our female friends, colleagues and the women who inspire us, have done and will do on behalf of women. An inspirational story that celebrates successful women in the South Burnett includes that of local lady Tiny Kenyon from Hidden Gold Homestead. Tina’s story of heartache to happiness featured in f-magazine last week; a magazine celebrating female success. Tina and her husband Clint own and operate an agri-tourism business in the Moffatdale region. They offer visitors the chance to experience ‘health, growth and happiness’ on their farm by allowing them to interact with the animals and explore what it means to grow food the way nature intended. For more information on Hidden Gold Homestead call 4168 4784 or to read the full editorial click here. Our two dam’s water levels are slowly dropping and this has been happening for some time. It’s hard to ignore but it’s a simple fact of life when you’re going through one of the worst droughts we’ve seen for some time. Boondooma currently sits at 35% and Bjelke-Peterson Dam at 8%. Despite the low water levels there’s still plenty of water in both dams to get out and catch some great fish. This past month has been great on the fishing front. 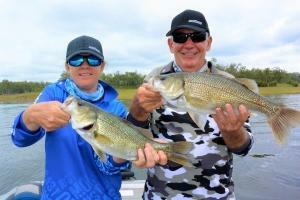 There’s always a few good fishing options for Boondooma. Early on in the day, your best option would be to hit the trees in either the Stuart or Boyne arms chasing Bass, Yellow Belly or even Saratoga amongst the spindly timber. I usually start here first when the arms are quiet and it usually pays off. I like to cruise amongst the trees with the electric motor and cast 5/8 Bassman Spinnerbaits or soft lipless cranks in tight to the spindly trees, let the lure sink from 3 to 5 seconds and start my retrieve. This usually accounts for a few Bass and Yellow belly. The Goldens particularly like lipless cranks cast tight to the structure and the Bass tend to hit as the lure bounces over the underwater structure. If you’re after a Saratoga casting surface lures when the water is still is a great way to catch one of these prehistoric fish. These techniques are a great way to fish and it can be nail biting stuff at times, especially when you hook up to a quality fish. BP has been the pick of the dams as far as numbers of fish go. Sessions of 20 to 40 plus fish are not uncommon and if you put the work in you can get some quality as well. 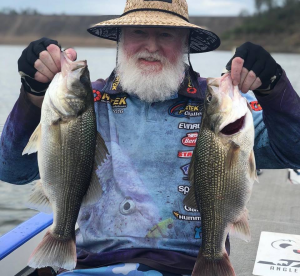 A few areas that have been fishing well lately are the open water straight out from the park boat ramp, wide of the Quarry and wide of bass point. Soft plastics rigged on a ½ ounce head have been very effective. Soft Vibes and spinnerbaits are also a great go to lure if the fish are sitting up off the bottom with a burn and kill retrieve. 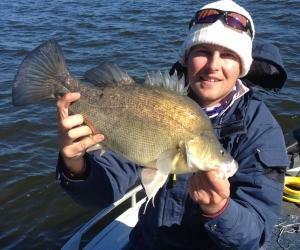 It was great to see another massive attendance at the Annual Yellow belly comp this year at Lake Boondooma. A huge thank you to everyone that attended this year’s event and made the weekend such a huge success. Thanks to the Boondooma stocking group lead by Terry Allwood who made it so enjoyable. These guys will put the money back into fingerlings for the dam to keep flourishing for years to come. The 2019 Muster will include a wide variety of country music including Australia’s premier country music artists, Tania Kernaghan, Anne Kirkpatrick, Tracy Coster, Amber Lawrence and Chris Callaghan. Along with other award winning artists Brendan Smoother, Bridget O’Shannessy, Clarrie Weller, Steve Sparrow, Chris Pritchard, Jack Viljoen, Homegrown and Brendan Radford. Backed by one of Australia’s best country music bands led by Brendan Radford, musical director for the Golden Guitar Awards. For the serious runners, or those who just want to have some fun, the festival celebrates all that Murgon has to offer with a half marathon and mega obstacle course rolling out across the stunning ‘Rail Trail’ at Murgon. The Rail Trail Fun Run Fever is a one-of-a-kind inflatable obstacle challenge based on one thing: having fun. Be prepared to wind your way through an imaginative and creative course across 45 minutes that is sure to challenge and surprise you. The mega inflatable race course includes mattress run, hurdles and the famous ninja wall making it one of the biggest obstacle courses ever to come to the bush. The Queensland Dairy and Heritage Museum is a popular tourist attraction at Murgon in the South Burnett. The Museum recognises the importance of the dairy industry in the early development of Queensland. The Museums main displays are housed in the former Bank of New South Wales building. Trinity is an original slab house built in 1893, entirely of crows ash timber, which gives visitors an understanding of the often difficulty life the early pioneers had to bear. Rest and relax in their well maintained and landscaped park. 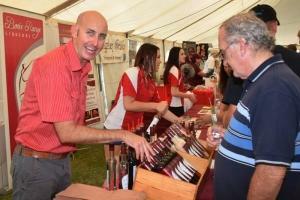 It’s only a short drive to their local wineries and many of the South Burnett’s tourist attractions. 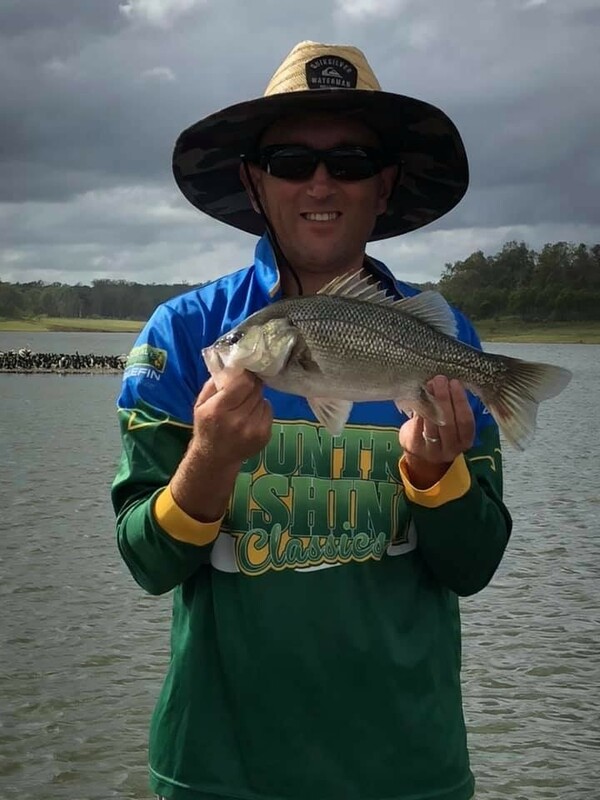 It’s been an interesting month of fishing in the two impoundments of the South Burnett, with the slight influx of water and the cooler weather setting in, there’s been a lack of consistent fishing as the water and season settles. As I write, the fishing has improved over the past few days and captures of big Natives in both BP and Boondooma dams are being reported. The water temps are slowly starting to lower but constant warmer afternoons have started to make the fish bite well. It’s been a very warm month with only a few mornings cold enough to pull on the jumpers. The fish seem to be somewhat quiet in the mornings but as the day warms, the fish have really been firing. 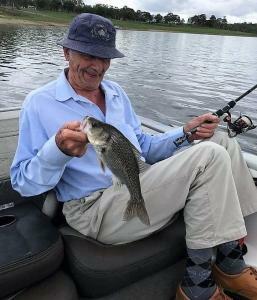 Boondooma has started to pick up, the bigger Bass and Goldens are starting to be caught on a variety of techniques as the fish begin moving up shallow. The last month has seen some inconsistency but some good fish are starting to be caught. 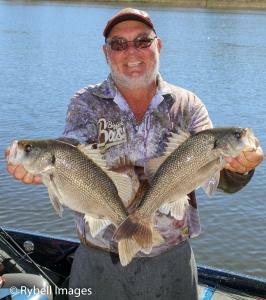 The great thing about Boondooma is that you can catch fish, fishing many different areas, covering a variety of techniques. In the mornings, when its cooler, I like to head up the arms of the dam and fish the edges as this seems to be the best option for those feeding fish early in the morning when it’s cool. I’ll cast a 3/8 Bassman spinnerbait or a lipless crank to the edge, let it hit the bottom and slow wind it out. The fish tend to move up on the edge during the night and will generally feed until the sun hits the water and starts to warm. This can be a great way of catching some big fish early, especially if you’re up in the timbered arms and there’s a lot of structure near the edge that you’re fishing. Another option is fishing the many weed beds that line the edge of the dam, Jerk Baits are a great option here. Cast the Jerk Bait up to the weed edge and crank it down a couple of winds, pause it and then begin a series of twitches as you wind. Remember that fishing close to the weed, you will come in contact with the weed regularly, so just give the rod tip a quick flick to get the Jerk bait free. Be patient with this technique as the Bass sitting in the weed pockets will eventually come out and hit the Jerk Bait hard. 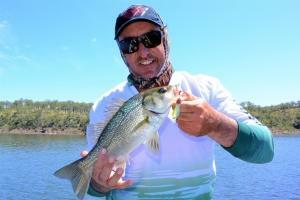 This is also a great option for catching some big Yellow Belly, particularly in the afternoon when the water is warm. 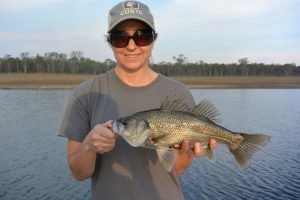 Annette Langford with a nice bass she caught casting to the weed edge. After the sun has been up for a while and the day starts to warm, I always move out to the deeper sections of the dam and target the schooled fish sitting out on the flats. Sound around until you’ve located a good showing of fish, generally this time of year I’ll be searching around the 15 to 25 foot mark. When a school is located you have a few options to cast at the fish to entice a bite. ½ rigged plastics, tail spinners, blades, spinnerbaits and soft vibes all have their place out on the flats and it’s just a matter of trying a few baits until you have one that you’re consistently catching fish with. Bait fisherman are still catching good numbers of fish up in the timbered arms tying off trees and fishing with live shrimps and worms as bait. Bait can be purchased at the kiosk and if you want the best bait, you can catch shrimp in the weed around the dam edges with opera house pots. 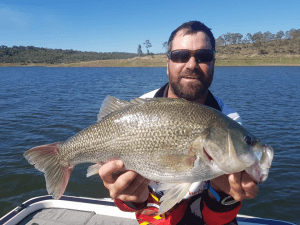 Trollers are picking up some good fish trolling around the weed edges and along the rock walls up near the dam wall and in the timbered arms with spinnerbaits and deep diving hard bodies. 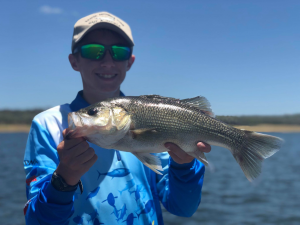 Fishing on BP has slowly been improving with some nice catches of Bass and Yellow belly coming in, particularly during the warmer afternoons. With the warmer afternoons and the cold morning the fish have generally been staying out deep in the 15 to 25 foot zone. Depending on the day, if it’s cool in the morning, I will target the weed edges with spinnerbaits, blades and tail spinners. It helps if the edges have spindly timber mixed in with the weed, as the fish tend to move up and feed around this structure early in the morning. 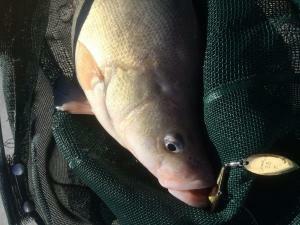 The Author with a colourful yellow belly caught on a spinnerbait off the edge. Later in the day, especially if it’s warm, I will move out deeper and target those fish sitting in the deeper flats of about 20 feet. The fish have been spread out over the flats next to Lightening Ridge, Bass Point, wide of Treasure Island and wide of the Quarry. The best way to target the fish out deep is using blades, tail spinners and soft vibes. Sound around these areas until you have a good show of fish on the sounder, then go through the above mentioned lures until you find one that gets you onto a couple of fish and stick with it. Make long casts and make sure the lure stays in contact with the bottom regularly. Use either a hopping retrieve, or a dead slow roll along the bottom. Persist with this long enough and you will eventually get a bite. Ecogear ZX blades are a real standout when the weather starts to cool. 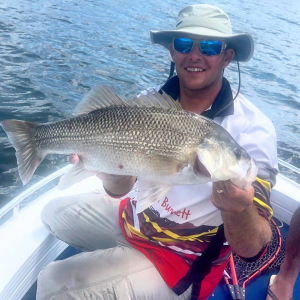 Trollers are picking up some nice bass trolling deep divers and spinnerbaits along the bottom in 12 to 14 feet over the above mentioned areas. Bait fisherman are picking up some nice catches of Bass and Goldens in the timber on shrimps, worms and yabbies but be wary the water is shallow before the timber. Red claw are still coming in with some nice catches being taken from the rocky areas of the dam as well as some nice catches in the bays with weed coming out from the edge. On a final note, it is with great sadness that we must say farewell to Corey and Nikki Goldie who have been managing the two parks for the last few years. 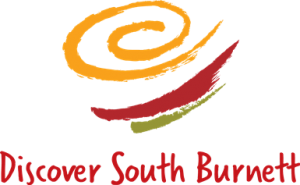 They have done an amazing job and have always been a welcoming face to the many thousands of visitors who have come to the South Burnett. We wish you all the best with your future endeavours and you will be greatly missed when you move forward. 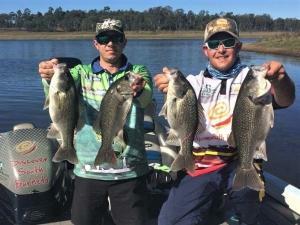 https://www.discoversouthburnett.com.au/wp-content/uploads/2018/05/fishing-report-1-8.5.17.jpg 761 1142 Stacey Perrett https://www.discoversouthburnett.com.au/wp-content/uploads/2018/01/Discover-South-Burnett-RESIZE-300x185.png Stacey Perrett2018-05-08 15:54:272019-01-07 12:59:06Winter fishing patterns begin in the South Burnett. The festive season is a great time of year to be outdoors with family and friends and It’s also the best time of year to be on the water as the temps are hot, beers are cold and the fishing is accessible to every angler of any ability. 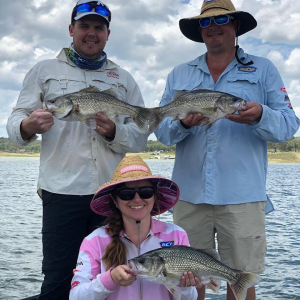 If you haven’t been out yet, make sure you start planning your next trip because this time of year is the best chance to get yourself onto some trophy size native fish from Lake Barambah and Boondooma. Over the past couple of months, the fish have moved into the thermocline and are a real target for our avid trollers. The 15 to 25 foot zone is where you will find them when you’re out in search of some fish. The most productive areas on the dam are the deeper sections of water around the dam wall and the Buoy line. The most productive bite time is from lunch time through until dark when the day is at its hottest. 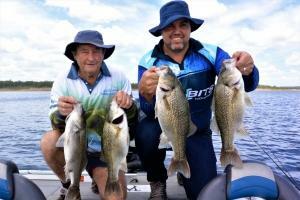 Sam and Ernie Bushell with a couple cracking bass caught casting near the wall at Boondooma. Lately i’ve been catching my best quality fish suspended in deep water. They have been sitting in the thermocline at 15 to 20 feet. I target these fish using a variety of baits, initially starting with a soft bait, a ½ ounce rigged soft plastic. I cast this out and begin counting to 7 seconds to let the lure sink into the strike zone. When the plastic is down to the desired depth I then start a slow roll and add a few twitches every now and then to change the swimming pattern, as the plastic glides through the water. Continue this until you get bites, but keep rolling the plastic until you get a solid hook up. If this method doesn’t work, don’t be afraid to change your lure until you are happy. 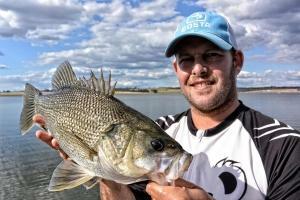 BP dam has been very consistent over the last two months, producing good numbers of fish of varying species and sizes. The fish are in great quantity but it just takes a bit of moving around to put yourself onto some quality. Areas to target are the deeper water out the front of the dam wall, wide of bass point and off any main dam points that hold deeper water of about 20ft. The fish have been sitting in the 15 to 20 ft mark and on the bottom in the same zone. I’ve been catching the majority of fish using a ½ ounce rigged plastic, with the same method as explained for Boondooma. Also heavier spinnerbait’s and Chatterbaits have been working well on the bigger fish when your focussing on the reaction bite. If you don’t have a boat, try walking the edges of the dam throwing hard bodies. Can be a very effective way of catching some nice natives. 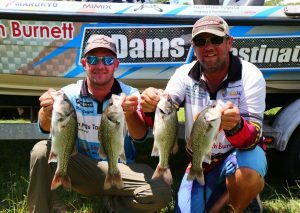 Make sure you book your camp site for the 2018 Boondooma Dam, Yellowbelly fishing comp being held on the 10th and 11th of February. $20 entry for adults and $5 for juniors (16 years and under). There are live and dead weight divisions with prizes for Bass, Yellow belly, Silver and Spangled perch. There are thousands of dollars’ worth of prizes up for grabs, with food and drinks available at the event. It’s one comp you don’t want to miss. Call Lake Boondooma kiosk to make a camp site booking on (07) 4168 9694. If you’d like to keep in regular contact with what’s happening on the dams don’t forget to like the Yallakool and Boondooma dams Facebook pages. Ficks crossing is a great waterhole about 5km south of Murgon. Ficks has a car park and picnic areas for the family to enjoy nestled right on the banks of Barambah Creek. 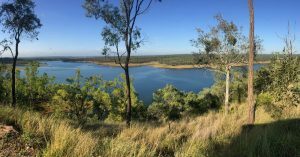 Take a picnic and enjoy some fresh caught fish or find Barambah Kayak Hire on Facebook to expand your South Burnett experience. Shaped like an upturned boat, the flat-topped ridge called Boat Mountain is a distinctive landmark near Murgon. Boat Mountain Conservation Park is a haven for wildlife and bird species, so take the time to look around and enjoy mother nature at her beat. You may see Rock Wallabies, Grey Kangaroos, Koalas, Echidnas and Goannas, The park has at least 60 species of birds and the list is growing. For a full bird list visit the Murgon Visitor Information Centre. The park is also popular with walkers, with tracks ranging for 370 metres to 2.2kms. The walking trail leads you up many stairs, but once a the top, you enjoy a relatively easy walk to Daniel’s lookout, at the peak of Boat Mountain. Wear protective clothing to avoid being scratched by prickly scrubs and have insect repellent on hand as well as sunscreen and lots of drinking water. The only facilities available at Boat Mountain is a picnic table. 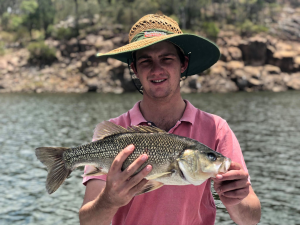 It’s a good feeling to know that summer is finally on its way, the water temps in both dams are rising considerably during the day which makes for some pretty intense fishing at times. 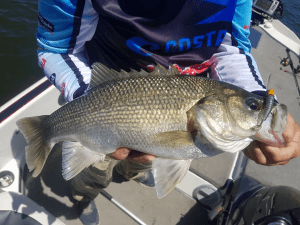 This time of year is up there with my favourite times to fish for Australian bass and yellow belly in our impoundments because they can be caught thick and fast as the bigger bass and yellow belly become vulnerable. Our natives like to suspend in the deeper water when the water warms and this opens up a variety of techniques including trolling as a great way to catch some big fish during these hotter months. The flavour of the month this month is Bass, and big ones at that, but it does pay to move around a bit in search of the right spot. Productive areas recently have been mainly the dam wall, the drop off from the shallower flats and the Spindly timber in the Stuart and the Boyne arms of the dam. Sound around the flats in search of the schools and cast ½ ounce rigged soft plastics, 12 – 20 gram spoons, Tail spinners and Blades. The timber is the place I would head to first as the fish hit hard and it’s a real challenge to get them out with your gear still in one piece. For this type of fishing I always use a stiff spin rod with some guts, a 2500 size spin reel for extra torque, spooled with 12 pound braid and 14 to 20 pound leader. 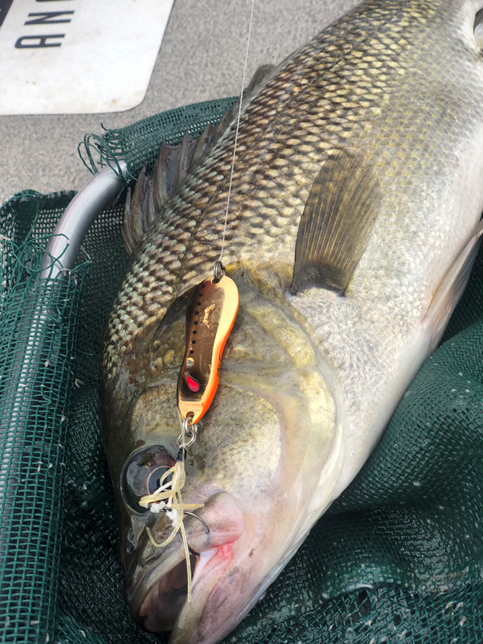 This may sound heavy but just imagine a 50cm bass hitting your lure as it’s rolled between two big clumps of spindly timber, it really counts for some exciting fishing. The lure of choice for this type of fishing is definitely a spinnerbait, or a lipless crankbait. I like to throw a Bassman Compact in 3/8 or 5/8 ounce. Once you have a combo similar to the above mentioned, head up the arms of the dam and cast in as close to the spindly trees as you can, let the lure sink for 3 to 5 seconds and start a slow roll. Make sure the drag is done up solid so they can’t get you in the timber without a hard fight. Once the bite comes give him everything you’ve got to get the fish away from any structure otherwise the fight will be short and you’ll be left wondering what happened. A big healthy bass from the suspended fish in deep water, keeping the lure in the zone is the key to take fish like this. If the timber isn’t producing, the next place I’ll look are the deep water off any prominent points or parallel to any steep rock walls. I’ll use my sounder to sound the fish sitting in that optimal depth, which is generally 20ft in the Thermocline. When I’m happy that ive found a good concentration of fish, I will pull up and begin casting 3” to 4” soft plastics rigged with a ½ ounce or 5/8 ounce head. With a big long cast over the areas that I found the fish, I will let the jig head sink 7 to 10 seconds and begin a slow retrieve back to the boat with a couple of twitches mixed in. The same can be done with a 12 gram Norries spoon. Continue this technique untill you start to feel a few taps on the plastic or spoon, when you feel a tap its important to keep that slow wind going unitll you feel weight on the line, slowly lift the rod tip until you feel the weight of the fish. At this point the fish will know its hooked and make some great runs back down into the deeper water. 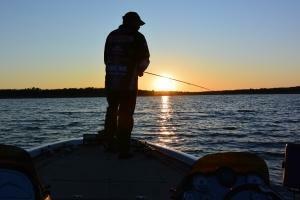 Keep your drag fairly loose so that the hook doesn’t pull on the way back to the boat. 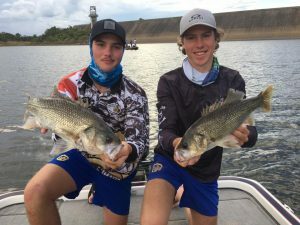 Trollers have been starting to pick up some nice Golden Perch and Bass trolling up in the arms of the dam as well as the main lake points and edges using deep diving hard bodies. Red claw have just started to pick up a bit with the consistent warm weather around the rocky edges. The fishing at Barambah has been spectacular with lots of fish being caught on everything, casting lures, jigging a bait and trolling. The key however is moving around to find the fish. The fish this month have been moving around considerably, I’ve found that the fish will be on one flat or bank one day then the next day they have moved a few hundred meters. This is not uncommon during the warmer months because the fish are active and purely moving around the dam with the bait they are feeding on. I always love fishing BP and I always like to go and start on the banks in the morning, I commonly cast lipless cranks or spinnerbaits to get an early reaction bite. The banks I’ll fish will generally be fairly steep with a bit of rock or structure. Another thing to keep an eye on is the sounder whilst you’re fishing a bank. It pays to make sure that there is bait or fish sporadically coming through. This obviously increases the chances of fish being caught on the bank that you’re targeting. Later in the day when the sun starts to get high I move out to the flats and commonly target areas in the 15 to 20 foot range. The fish seem to really relate well to this depth in BP and it pays to visit multiple areas like this until you find a good school. Another thing to note that in summer time in BP the fish like to sit high in the thermocline (or comfortable water) If you’re on the water and this is the case slow roll any smaller bait like a blade, through these suspended fish. In this situation it’s not uncommon to have a great session when the fish are sitting high in the water column. Trollers are having the same luck by trolling the edges of the dam and out in the 15 to 20 foot range with deep diving hard bodies, most trollers won’t have to go far before hooking up with a fish or two. 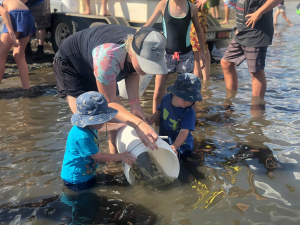 Those using bait, the fish are coming from most locations close to the bank using, live shrimp, salt water yabbies and worms fished hard on the bottom. Make sure you book your camp site for the 2018 Boondooma Dam Yellow belly fishing comp being held on the 10th and 11th of February. $20 entry for adults and $5 for juniors (16 years and under). There are live and dead weight divisions with prizes for Bass, Yellow belly, Silver and Spangled perch. 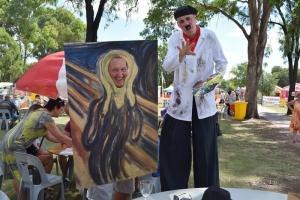 There are thousands of dollars’ worth of prizes up for grabs, with food and drinks available at the event. It’s one comp you don’t want to miss. Call Lake Boondooma kiosk to make a camp site booking on (07) 4168 9694. Finally also don’t forget that this year’s New Year’s eve party at Lake Boondooma is shaping up to be the biggest and best we’ve seen, so write that down in your calendar and book a site for this year’s fireworks spectacular. If you’d like to keep in regular contact with what’s happening on the dams don’t forget to like the Yallakool and Boondooma dams Facebook page. 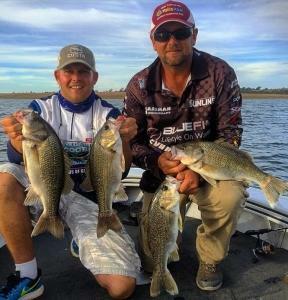 https://www.discoversouthburnett.com.au/wp-content/uploads/2017/11/oct-fishing-report-photo-4.png.jpg.png 872 959 Stacey Perrett https://www.discoversouthburnett.com.au/wp-content/uploads/2018/01/Discover-South-Burnett-RESIZE-300x185.png Stacey Perrett2017-11-07 22:50:532019-01-07 12:59:07Spring heat brings the big fish out! Boots and hats are the order of the day as the visitors lined the auditorium for this year’s Murgon Music Muster. One of the biggest events of the year for this little town,as the local residence await the highly anticipated arrival of singing sensation Gina Jeffereys. The Murgon showground is bursting at the seams with people camped out to enjoy four days of non-stop music. This year’s program is set to delight music enthusiasts with a multitude of entertainment on offer, from country rock, classic, bush ballads and bush poetry. The Murgon Music Muster is currently on at Murgon Showgrounds from Tuesday 31st October to Sunday 5th November. Spring is finally here and it’s the time of year that I always look forward to. The water temps are gradually increasing and our native fish in our stoked impoundments really spring into life and start gorging themselves, which means for us anglers a great time to be on the water. In my last report the water temps were down around 16 degrees and the fishing was good, but as I write the water temps have increased slightly and the fish have really started to fire up. The edge bite has somewhat slowed a little but the flats fishing has been insane. Some good Yellow belly and Bass can still be caught from the edges early if you’re casting lures. I’ve found the best areas to target are the steeper rocky edges with some timber, and the remains of the weed beds that outline the dam in 8 to 10 feet. Some great techniques for targeting the fish on the edge is using suspending jerk-baits and 12 gram spoons burnt over the top of the submerged weed. Both presentations entice the fish to come out of the weed and smash a paused jerk-bait or chase a moving spoon as it zips past overhead. The jerk-bait presentation is a slow retrieve with a lot of pauses and the spoon presentation is all about long casts and a steady fast retrieve to keep the lure above the weed, I find dropping the spoon back to the weed occasionally is a good way to keep that lure in the zone. The old submerged weed edges still hold some cracking Bass but I’d be moving to the 20 to 30 foot flats to start looking about mid-morning as the day starts to heat up. Areas I like to start looking are the Junction to Pelican point edges out 80 meters from the bank in 20 to 30 feet of water. There’s a few baits that have really been working well but if you cast anything that imitates a bony bream you’ll be in with a good chance of hooking up with a good fish. 12 gram Nories Tail spinners and Spoons and ¼ ounce blades have been working really well, but soft plastics have also accounted for a few good sessions. A pair of Nice bass caught from the edge, burning spoons over the submerged weed beds. 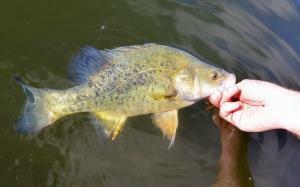 The local yellow belly are in great condition and are willing to take a well presented lure. The key to using a spoon on schooled fish is to let the lure sink to the bottom and slow wind the bait through the fish. If you think you’ve got the lure too high through the fish make sure you drop it back down through them and start the retrieve again. Eventually you will get a bite, persistence is a big key when fishing anywhere. Bait fisherman have been doing well out on the flats. Use your sounder to locate a good showing of fish in the 20 to 30 foot range. Once you find a good show, anchor up and drop down using live shrimp. The great thing about live shrimp is that you can catch them in the dam itself. It shouldn’t be long until you have some nice fish coming to the boat. A great tip for bait fishing is making sure that you have some fresh bait and also make sure your knots are tied well as the fish on the flats can be big and can leave you broken hearted if you’re not prepared. If you’re trolling, the fishing should improve as the waters temps continue to rise but there have been some reports of fish trolled up in the timber of the Boyne and Stuart arms. The key is to use deep diving hard bodies in dark colours. Red claw have been moving well with the warmer water bringing them back to the pots. 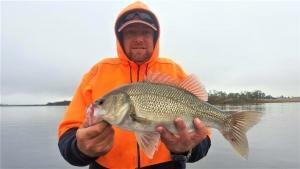 The same is happening at Lake Barambah, the water temps have risen and the fish are really active. 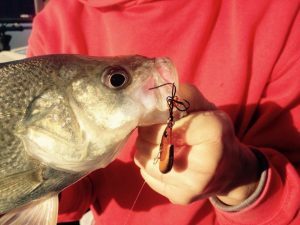 Fish are responding to most lure techniques but the bigger fish have been coming from the points and edges. The most effective lures have been ¼ blades, spinner baits, lipless cranks and ¼ ounce rigged 3 inch plastics. You’ll note that most of these baits imitate the bait that fish are feeding on which is masses and masses of small bony bream, gudgeon, sleepy cod, barred grunter and spangled perch. 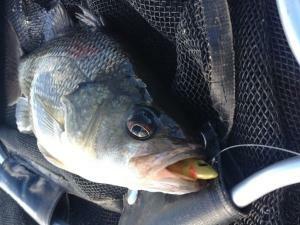 The Yellow belly at BP are very willing to take a spinnerbait cast at the edge in spring. I’ve been fishing the dam quite regularly and have had some of the best fishing from the edges that I can remember. Nice Yellow belly and big Bass have been caught every trip. The key to success however is finding the right bank to fish. If you’re an avid lure angler like me, pick an edge and start moving along it. I like to sit about 30 meters from the bank and fan out casts, trying to cover as much water as possible. Keep moving along the edge and eventually you’ll come across a lure that works for you. Once you’ve caught a fish, there’s a big chance that there will be more in very close proximity so make sure you cover that water thoroughly. The big fish have been hanging out together, so if you get one there’s a chance you’ll get a few. Bait fisherman have been catching good bags of fish around the edges of the dam, and from the shore using live shrimp, saltwater yabbies and worms. 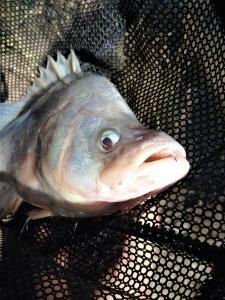 Trollers are picking up the odd fish trolling around Lightening ridge and around the edges of the dam. The trolling will be fantastic in the coming months as the fish move up in the water column and start to suspend with the warmer weather. The red claw have been really moving with some big numbers being caught so now’s the time to drop the pots in. 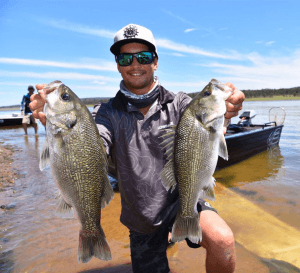 If you’re an avid troller or hard bodied lure enthusiast, the Golden Lure comp is on at Boondooma dam on October the 20, 21, 22, so if you’re looking at coming to the dams to stay make sure you give the guys at the kiosk a call and they’ll book your site tailored to your needs. 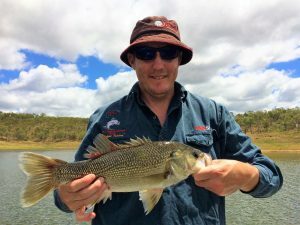 Give Yallakool a call on 07 4168 4746 or Boondooma on 07 4168 9694.
https://www.discoversouthburnett.com.au/wp-content/uploads/2017/09/fishing-report-sept-1.jpg 462 720 Stacey Perrett https://www.discoversouthburnett.com.au/wp-content/uploads/2018/01/Discover-South-Burnett-RESIZE-300x185.png Stacey Perrett2017-09-06 03:11:592019-01-07 12:59:07Freshwater fishing a big hit in the South Burnett. With the unseasonably warm weather hanging around for quite some time the warm weather gear hasn’t had to make much of an appearance of late. The last few weeks however have seen the water temps slowly drop but the fish are still active and still hungry. 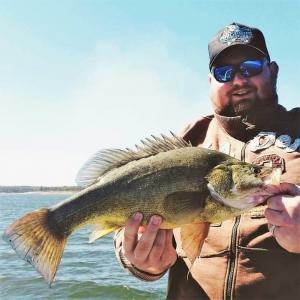 With the cold moving in fast now, the edge bite and shallow flats bite has really fired up and you should be able to bag yourself some really healthy Bass and Yellowbelly over the coming months. 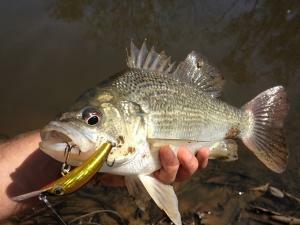 The great thing is this time of year the Bass and Goldens are fat and healthy and a whole new array of lures can be used to target the natives in our local dams. Recently the best techniques have been to hit the edges early with lipless cranks and spinnerbaits, rocky or weedy edges being the best to target. 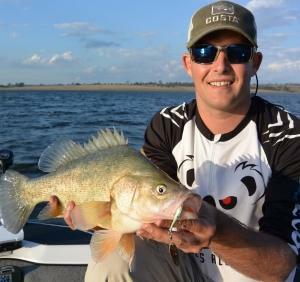 Another good way of finding good fish is sounding over the main lake points and large shallow flats in the main basin in search of the large schools that generally congregate at this time of year. In the morning when it’s quiet and still is the best time for this type of fishing because the water temps are at their lowest and the dam is at its quietest. Having a good quality sounder is important when trying to locate the schools as you’ll pick up the fish close to the bottom when you’re searching. Once a school is located position the boat towards the school and cast ¼ or 3/8 ounce Eco gear VX, ZX or Little Max blades, let the blade hit the bottom and use a slow hopping or roll retrieve. Occasionally change it up and use a slow roll and kill technique as the fish will hit the lure when it’s close to the bottom, as it’s falling or just after it’s rolled off the bottom. Later in the day when the water heats up I’ve found that the fish can be caught well using Nories tail spinners, 12 gram being the best. Cast the tails spinner out with a long cast and let it sink to the bottom, wind up the slack and slowly lift the rod tip then drop it back to the bottom keeping contact with the lure at all times. The fish this time of year love a bait that is falling in their face and the tail spinner suits the bite perfectly. The fish will hit the tail spinner generally as its falling after the lift so be on your toes for the bite. Ice jigs are also a great way of catching the schooled fish as its constantly in their face, keep an eye on the sounder with this technique though as you’ll get more bites when the fish rise off the bottom. This generally means they are flared up and ready to eat. Trollers are getting some good yellow belly in the arms of the dam using deep diving hard bodies. Troll in close to the timber near the rocks in the Boyne arm but make sure that you have a lure retriever handy because you will get snagged occasionally, but your hard work will be rewarded. Bait fisherman your best chance is to fish the trees in the arms of the dam in 20 feet of water with live shrimp. 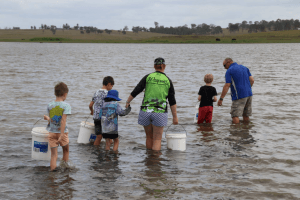 You can catch the shrimp using opera house pots with a bit of steak just below the Kiosk, or around the lakes edges, so it pays to get live bait, even better when you can get it from the dam your fishing in. Some great reports of good numbers of big red claw coming in, dog biscuits and soft vegetables proving to be great bait for their opera house pots. Rocky ledges and points are the best spots to drop your pots but make sure your pots are clearly marked with your name and address. The fishing over the past month has slowed down a little but you can still catch some very decent fish if you’re up early and fish patiently. The fish have been up on the edge early when the waters cool and I’ve been catching some good Bass and Yellow belly using ½ ounce rigged grub tail plastics. Target rocky ledges with a bit of timber or rocks. As the sun gets higher I always move to the deeper flats and target areas around points and flats, spots around lightening ridge, bass point and the Quarry are likely spots to find fish sitting out deeper. If you’re not familiar with the places I mentioned, call into the Kiosk, they are always willing to explain where they are. If the regular deeper areas don’t produce it’s a good idea to sound around the outskirts of the dam and find those fish sitting in 10 to 20 feet of water. Once located, target them with the techniques that I mentioned for the Boondooma flats. Blades, tail spinners and ice jigs are the go to lures to use when the fish are sitting out deep. Both dams are reasonably similar but sometimes it does pay to experiment with your lure selection. 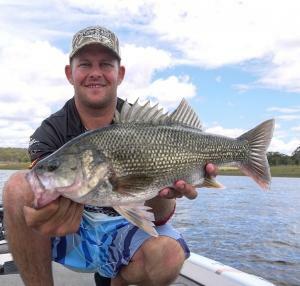 The bass are getting bigger, models of up to 45 cm have been caught recently off the edges and out on the flats. 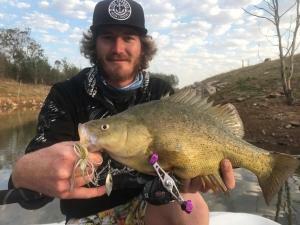 If your chasing yellow belly, fish tight in around any timber on the dam with lipless cranks or spinner baits, persist long enough and you’re sure to get a couple. Yellow belly over 50cm have been caught recently using this technique, afternoon when the waters warmer proves to be the best time. 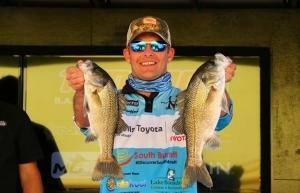 Corey Goldie with a big fat Bass taken wide of Bass point on a plastic. Trollers are getting some nice yellow belly up in the timber of an afternoon but be wary the water is shallow going into the timber You can still troll through the timbered areas up the back of the dam with shallow to medium diving hard bodies. 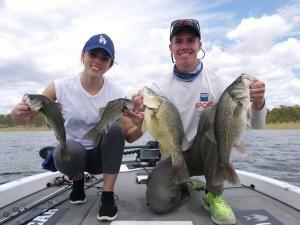 Some bass have also been mixed in with their catches. 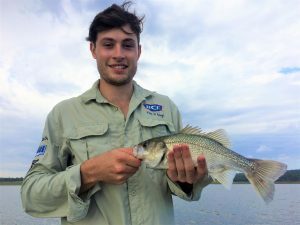 Bait fisherman have also been having some success, they’ve been catching mixed bags of Yellow belly, silver perch and bass from the timber. Tie up to a tree and use live shrimp as bait. Drop your bait to the bottom and slowly jig the bait, if your first spot doesn’t produce don’t be afraid to move several times until you know you’re sitting on some active fish. The red claw are still around but you’ll have to put in the effort for a feed, target rocky edges or spindly timber and use soft vegies for bait. If you’re looking at coming out our way and wanting to stay at either park give us a call and we’ll book your site tailored to your needs. Give Yallakool a call on 07 4168 4746 or Boondooma on 07 4168 9694. That’s this month’s wrap up of the two dams. 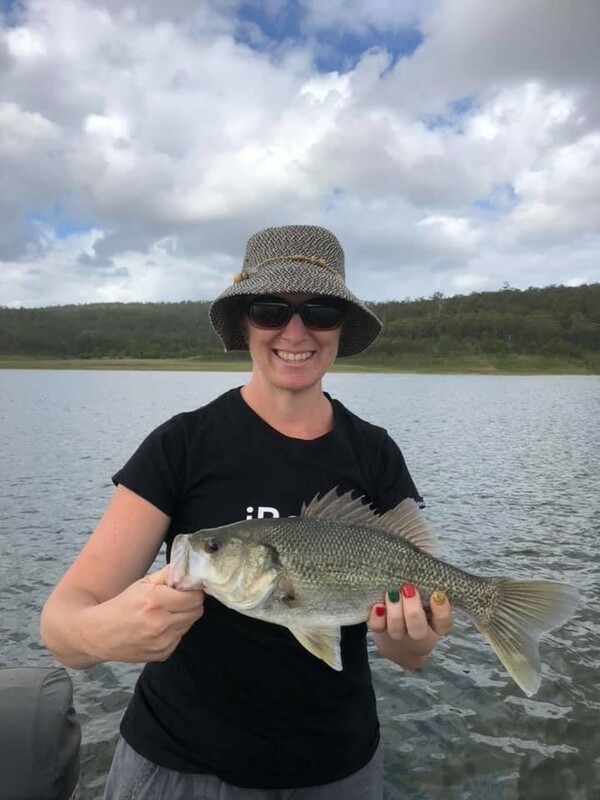 https://www.discoversouthburnett.com.au/wp-content/uploads/2017/06/Fishing-Report-6.6.17.jpg 720 960 Stacey Perrett https://www.discoversouthburnett.com.au/wp-content/uploads/2018/01/Discover-South-Burnett-RESIZE-300x185.png Stacey Perrett2017-06-06 06:49:012017-06-06 06:50:29Cold mornings and Big Bass in the South Burnett. 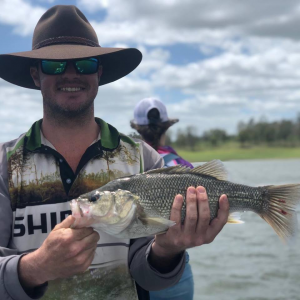 It’s been an interesting month of fishing in the impoundments of the South Burnett, with the recent influx of water, there’s been a lack of consistent fishing as the water settles. As I write, the fishing has improved over the past few days and captures of big Natives in both BP and Boondooma dams are being reported. The water temps are slowly starting to lower but constant warmer afternoons have started to make the fish bite well. It’s been a very warm month with only a few mornings cold enough to pull on the jumpers. The fish seem to be somewhat quiet in the mornings but as the day warms, the fish have really been firing. Boondooma has started to pick up as the water clears, the bigger Bass and Goldens are starting to be caught on a variety of techniques. The last month has seen some inconsistency but some good fish are starting to be caught. 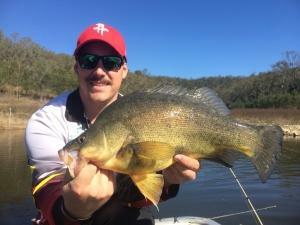 The great thing about Boondooma is that you can catch fish, fishing many different areas, covering a variety of techniques. In the mornings, when its cooler, I like to head up the arms of the dam and fish the edges as this seems to be the best option for those feeding fish early in the morning. I’ll cast a 3/8 Bassman spinnerbait or a lipless crank to the edge, let it hit the bottom and slow wind it out. The fish tend to move up on the edge during the night and will generally feed until the sun hits the water and starts to warm. This can be a great way of catching some big fish, especially if you’re up in the timbered arms and there’s a lot of structure near the edge that you’re fishing. John Francis with a nice Yellow belly from the edge on a spinnerbait. After the sun has been up for a while and the day starts to warm, I always move out to the deeper sections of the dam and target the schooled fish sitting out on the flats. Sound around until you’ve located a good showing of fish, generally this time of year I’ll be searching around the 15 to 25 foot mark. When a school is located you have a few options to cast at the fish to entice a bite. ½ rigged plastics, tail spinners, blades, spinnerbaits and soft vibes all have their place out on the flats and it’s just a matter of trying a few baits until you have one that you’re consistently catching fish with. Recently soft plastics have really been the standout lure fished along the bottom. A key to getting a good flats bite though is having an afternoon where it’s quite hot and you have a slight breeze on the water. This combination of warmth and current tends to get the fish biting. 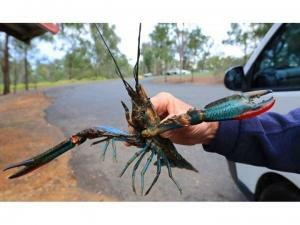 Above – The recent influx of water has made the big red claw move in BP and Boondooma. Red claw are really on the move since the influx of water make sure you pack the opera house pots. Fishing on BP has fired up again with some nice catches of Bass and Yellow belly coming in, particularly during the warmer afternoons. With the warmer days the fish have generally been staying out deep in the 15 to 25 foot zone. 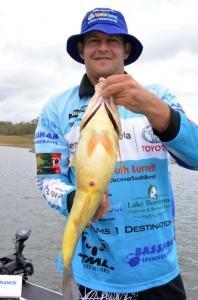 The Author with a nice Yella on a tail spinner from BP. Later in the day, especially if it’s warm, I will move out deeper and target those fish sitting in the deeper flats of about 20 feet. The fish have been spread out over the flats next to Lightening Ridge, Bass Point, and wide of Treasure Island. The best way to target the fish out deep is using plastics, blades, tail spinners and soft vibes. Sound around these areas until you have a good show of fish on the sounder, then go through the above mentioned lures until you find one that gets you onto a couple of fish and stick with it. Make long casts and make sure the lure stays in contact with the bottom regularly. Use either a hopping retrieve, or a dead slow roll along the bottom. Persist with this long enough and you will eventually get a bite. The author and Corey with the goods after a successful session in the depths of BP. 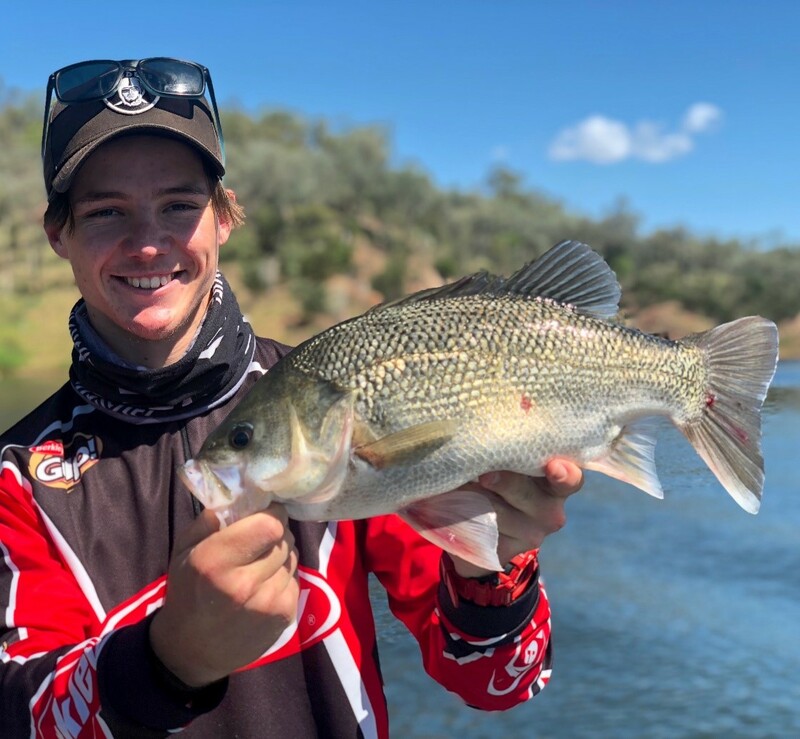 The tackle shops at both dams are fully stocked, and the Yallakool kiosks lure range has also had a major facelift with a great new range of lures in stock. All lures on the wall are just what you’ll need to target Bass and Yellow belly in BP and Boondooma dams. The staff at both dams are very helpful when it comes to locations on the dam for the best fishing and what lures to use. So please don’t hesitate to ask. On a final note, if you’re not just staying in the parks for the great fishing, make sure you check out the tourist information centres at both of our dams. There’s maps and brochures of all the great attractions around the South Burnett region all within a short distance of the parks for you to enjoy. 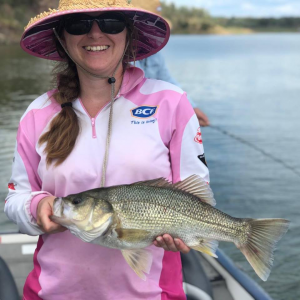 https://www.discoversouthburnett.com.au/wp-content/uploads/2017/05/Fishing-report-_-April-2.jpg 540 720 Stacey Perrett https://www.discoversouthburnett.com.au/wp-content/uploads/2018/01/Discover-South-Burnett-RESIZE-300x185.png Stacey Perrett2017-05-12 03:08:432017-06-06 06:43:21Big Natives start to play in the South Burnett. Boondooma and Lake Barambah have seen a recent influx of water from Tropical Cyclone Debbie. With the rain, came the run off, and we’ve seen some welcome water flow into our two dams. Currently Boondooma is sitting at 53% and BP 24%. The fisherman haven’t been disappointed as both dams have been fishing well but have been a little slow due to the weather and the recent rain. It’s great to see so many people coming to our dams as the water levels rise, the next few weeks should see the fishing improve considerably. 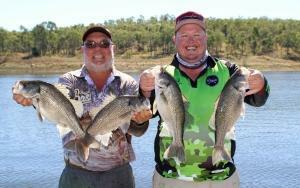 Boondooma has been fishing reasonably well in the main basin of the dam. There are a few very good options when your fishing during this time of year, though it does pay to be patient. The deeper water around the dam is holding big Bass and Yellow belly suspended in the Thermocline (comfortable water) and these fish are very willing to eat most offerings presented to them, given time. The trick is to locate these suspended fish before casting. It really pays to have good electronics on your boat as sounders are the best way to locate concentrations of fish. The fish in the basin have been the bigger ones, Bass over 50cm have been caught, so it pays to spend the time sounding to find the fish to cast at. Sound around areas like the rock walls near the dam wall and the major rocky points around the front of the dam. Here, the water is at its clearest due to the recent inflow. 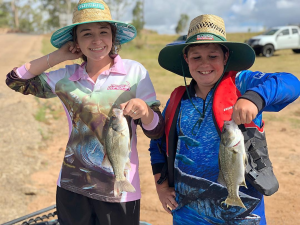 When a school has been located start by casting 5/8 spinnerbaits, 20 gram spoons and ½ rigged soft plastic and count from 5 to 7 seconds depending on how deep the fish are sitting. Consistent fast retrieves have been working best and it pays to put in multiple casts before you get a bite or a fish. ½ ounce rigged plastics have been a popular choice amongst anglers as the bait is a smaller profile and can be burnt fast as well to initiate a strike from any hungry fish. The Yellow Belly in Boondooma are fat and ready for winter. Anglers young and old are still enjoying the fishing at BP, this bass was caught casting a ½ bassman spinnerbait. The timber is another great option, especially if you’re a bait fisherman as the fish are still holding around the trees in both arms. If you don’t have a sounder to work on the fish in the basin, this would be the smartest option, although the water is quite dirty due to both arms receiving water so lures in the arms aren’t a great option at the moment. The water is still quite warm so the fish should stick around in the trees until it starts to cool down. 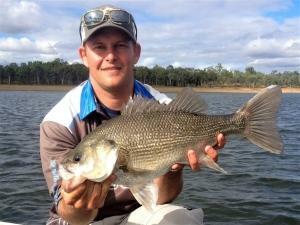 Bait fishing in the Timber is another great option for Boondooma with some influx of dirty water. Live shrimps and worms are the best option. 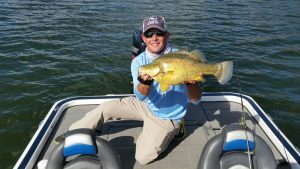 Trollers are catching some nice bass and goldens in the main basin trolling 5/8 spinnerbaits and deep diving hard bodies. Red claw have been coming in pretty thick of late and some big lobster size ones as well. Set your pots close to any rock structure or thick timber and you’re in with a good chance of a feed. Soft fruit and vegetables have been the best bait as well as dog biscuits. BP has been a little tough of late for the lure casters due to the weather but fish are still getting caught if you’re willing to put in the time. Bass and goldens in some areas have been thick and sessions in the double digits still aren’t uncommon, so keep working on them if you’ve found a good show of fish. Best areas of late have been around the lightening ridge area and the quarry, fishing down the drop offs. The deeper water from Bass point right down the middle to the public boat ramp is also worth of a drift or two. Best baits have been ½ ounce rigged plastics, ¼ ounce blades spinnerbaits and chatter-baits. Because BP is a shallow dam most fish generally congregate around areas in the dam where drop offs are. The best way to find these drop off is to use your sounder and find them or look for points or banks that drop away quickly. Cast your lure up shallow and slowly wind it down the slope and try to keep it close to the bottom. I always try to imagine where my lure is sitting close to the bottom to keep in contact with the fish or the “strike zone”. I consistently let the lure touch the bottom so that I know I’m always close as I wind my lure back to the boat. Using this method usually puts you onto fish eventually. ½ ounce rigged plastics are the stand out bait at BP recently. Be wary from Bass point onwards towards the timber as the water is still quite shallow. 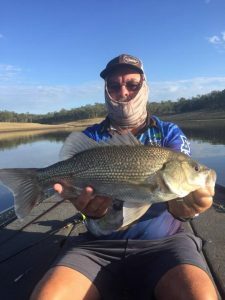 Trollers are getting some nice bass and goldens trolling over the drop offs out from Bass point and down the middle of the dam between bass point and the caravan park boar ramp also try trolling over the prominent points of the dam using spinnerbaits and blades. Bait fisherman are getting heaps of table fish, fishing just about anywhere on the dam that is over 10 feet deep and near any structure. Best baits have been shrimps and worms. There is some red claw still about as well so make sure you pack the pots. On a final note, if your needing to know any information about fishing spots on the dam or want any tackle for your weekends fishing, both Kiosks have a great amount of information and all the latest tackle that will help you on your way to some great fishing.